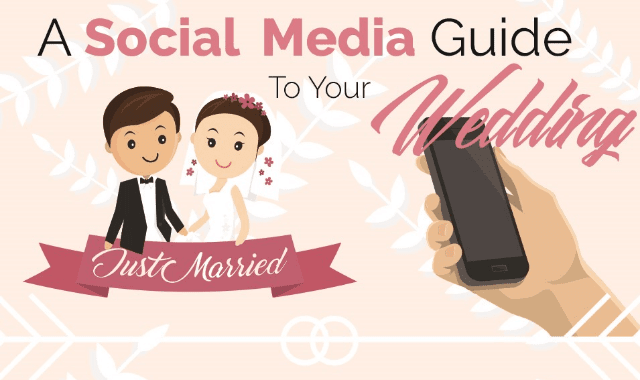 A Social Media Guide To Your Wedding #Infographic ~ Visualistan '+g+"
You’re getting married. Congratulations! You might not have thought much about how social media can affect your big day, but unless you put a ban on mobile phones, chances are, there’ll be photos and comments from your day across different social networks. But do you know your hashtag from your trend? Your retweet from your share? And do you understand just how social media can help or hinder both your planning and the day itself? Have you thought how to Instagram your wedding? How to Facebook your invites? Or how to snapchat your story? It’s another stress you don’t need, right? Well, don’t worry. We’ve got you covered with our Simple Guide to Social Media Success at your wedding.